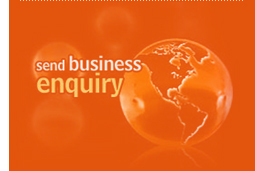 ... defines a complete range of hydraulic miniature fittings, check couplings and accessories. 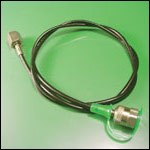 MCS offers a simple, inexpensive means to check pressure in hydraulic systems. 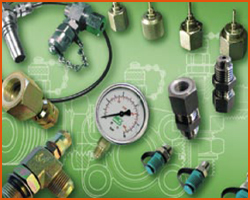 Permanently mounted pressure gauges and shut-off valves are no more necessary, thereby reducing initial costs. 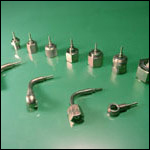 Replacement costs due to gauges broken by system problems or external damage are also eliminated. 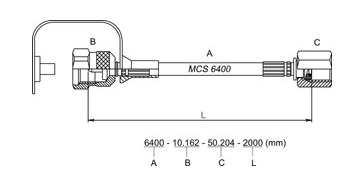 MCS check couplings can be installed at any point of the hydraulic system where pressure is to be monitored. For remote or hard-to-reach locations, an MCS bulkhead coupling and an MCS micro-bore hose bring pressure to a central panel thus simplifying its control. The micro-bore hose is so small and flexible that it can be installed like electrical wiring. Pressure can be checked while hydraulic systems are at full pressure. 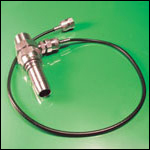 Micro test fittings and micro-bore hoses can bear a max. working pressure of 630 bar. Thanks to their design, both the connector and the micro hose coupling can be joined under pressure by screwing the coupling with two fingers without any tools and any leakage; the connection is self-sealing and will not loosen under vibration or pressure peaks. 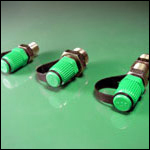 MCS offers optional hose ends to adapt to many other test couplings from other suppliers. Besides, they can be used for obtaining fluid samples from various points in hydraulic systems or as an air bleed device. The "Mini Control System" is versatile enough to be used instead of rigid pipes for pressure gauges, pressure switches, pressure transducers, pilot lines, etc. It dampens pressure peaks and prevents vibration from reaching the instruments, thanks to the micro hose's capillary effect.